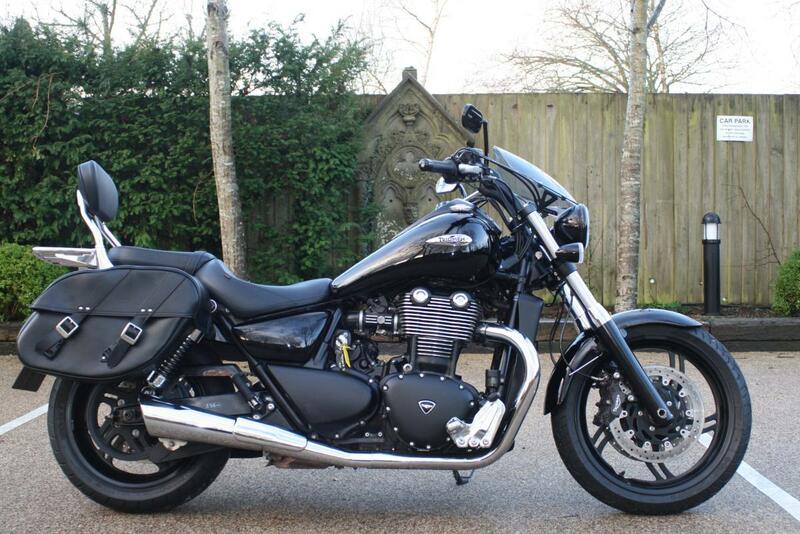 We are delighted to be able to offer you this awesome one owner TRIUMPH THUNDERBIRD STORM. Fantastic specification and well worth a look. Triumph Thunderbird Storm’s a cut above the class convention. The suspension, like most Triumphs, is well set-up; the brakes excellent, the whole plot taut enough to pleasingly swing through a series of country bends. The edgy, stripped down, styling is complemented perfectly by the iconic twin headlights, made famous on Triumph’s legendary Rocket III and Speed Triple models, give the Thunderbird Storm a street rod look straight from the box. With a 1700cc parallel-twin at its heart the Thunderbird Storm is a power cruiser that packs a mighty punch. The tank mounted speedo includes a small built in tacho and on-board computer which includes clock, two trip meters and a fuel gauge. The low maintenance belt drive system delivers the torque smoothly and cleanly, while the cycle parts ooze class and quality. Anti-lock brakes offer extra security and safety to the rider and passenger. Low rate finance is available on this bike, credit subject to acceptance. For a no obligation quote, please call 01747 811196 and select option 1 for sales. Thanks for looking!! Moto Corsa experts in all things Italian and British. Sign Up To Our Newsletter For Weekly Updates! You can change your mind at any time by clicking the unsubscribe link in the footer of any email you receive from us, or by contacting us at marketing@motocorsa.co.uk. We will treat your information with respect. For more information about our privacy practices please visit our website. By clicking below, you agree that we may process your information in accordance with these terms. © Motocorsa Ltd Copyright 2018. All Rights Reserved.